We are so excited to learn about a special Halloween event coming to The Edison at Walt Disney World. The Edison is an extremely fun venue that is located within the Disney Springs area. 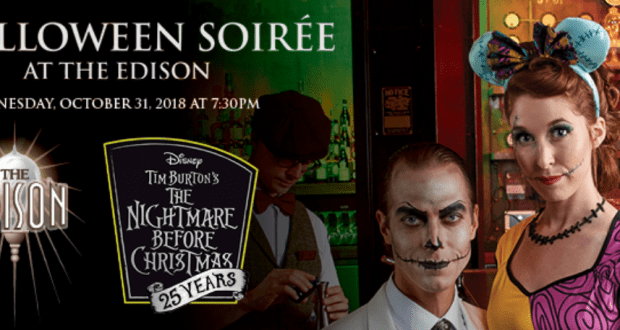 The event will be held on Halloween Night, 2018 and will celebrate the 25th anniversary for The Nightmare Before Christmas. Guests are encouraged to come dressed up for Halloween in attire that will celebrate the classic film. Guests will also get to enjoy small plates and a variety of drinks that are inspired by Nightmare Before Christmas, too! You also can’t forget the amazing entertainment! The event will be held on Wednesday, October 31st, 2018 with the doors opening at 7:30 PM. The tickets cost $85 per person, plus applicable taxes and gratuities. All guests must be 21+ in order to attend the event. The event will include passed hors d’oeuvres and cocktails and then The Edison’s full food and beverage menu will be available for additional purchases. Who else would love to spend Halloween at this event?